NYU (US) — A new ultra-sensitive biosensor can identify the smallest single virus particles in solution, which could shrink the wait for test results from weeks to minutes. Stephen Arnold, of the Othmer-Jacobs Department of Chemical and Biomolecular Engineering, and researchers from New York University-Poly’s MicroParticle PhotoPhysics Laboratory for BioPhotonics (MP3L) report their findings in the most recent issue of Applied Physics Letters. Their technique is a major advance in a series of experiments to devise a diagnostic method sensitive enough to detect and size a single virus particle in a doctor’s office or field clinic, without the need for special assay preparations or conditions. Normally, such assessment requires the virus to be measured in the vacuum environment of an electron microscope, which adds time, complexity and considerable cost. Instead, the researchers were able to detect the smallest RNA virus particle MS2, with a mass of only 6 attograms, by amplifying the sensitivity of a biosensor. Within it, light from a tunable laser is guided down a fiber optic cable, where its intensity is measured by a detector on the far end. A small glass sphere is brought into contact with the fiber, diverting the light’s path and causing it to orbit within the sphere. This change is recorded as a resonant dip in the transmission through the fiber. When a viral particle makes contact with the sphere, it changes the sphere’s properties, resulting in a detectable shift in resonance frequency. Arnold and his co-researchers achieved this by attaching gold nano-receptors to the resonant microsphere. These receptors are plasmonic, and thus enhance the electric field nearby, making even small disturbances easier to detect. Each gold “hot spot” is treated with specific molecules to which proteins or viruses are attracted and bind. “When the body encounters a foreign agent, it responds by producing massive quantities of antibody proteins, which outnumber the virus. If we can identify and detect these single proteins, we can diagnose the presence of a virus far earlier, speeding treatment,” Arnold says. 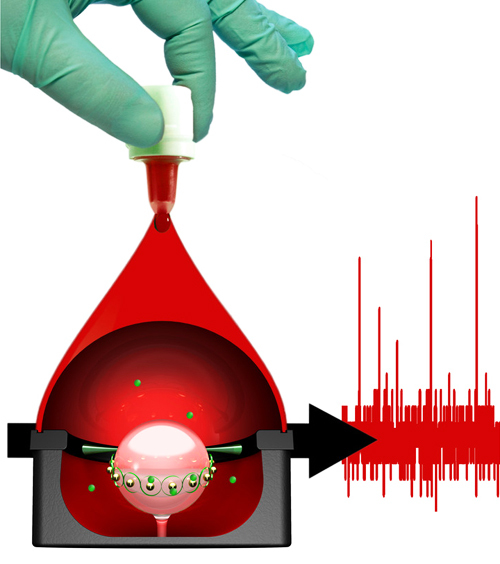 This patent-pending technology, co authored with postdoctoral fellow Siyka Shopova and graduate student Raaj Rajmangal, is ultimately designed for a point-of-care device capable of detecting viruses or disease markers in blood, saliva, or urine. Testing for commercial applications is already under way. The sensor itself, called a Whispering Gallery-Mode Biosensor, is unique to Arnold’s work. Its name derives from the famous Whispering Gallery in the dome of St. Paul’s Cathedral in London. Much the way its unique acoustics allow a whisper to be heard anywhere within the circular gallery, light traveling within the glass sphere of the biosensor orbits many times, ensuring nothing on the surface is missed. The technique was pioneered by MP3L post-doctoral researchers, graduate and undergraduate students, along with Stephen Holler, NYU-Poly alum and now an assistant professor of physics at Fordham University. A technology entrepreneur, Holler founded NovaWave Technologies, a chemical sensor company, at one of NYU-Poly’s business incubators. Thermo Fisher Scientific, one of the world’s leading providers of scientific and laboratory equipment, acquired NovaWave in 2010. Other authors of the paper are Venkata Dantham, NYU-Poly postdoctoral fellow; Vasily Kolchenko, now professor at New York City College of Technology’s Department of Biological Sciences; and Zhenmao Wan, currently a graduate student in the Department of Physics at Hunter College of CUNY. This research was originally supported by provost seed funds from the New York University School of Arts and Sciences, in a grant jointly awarded to Arnold and NYU Professor of Physics David Grier. The National Science Foundation provided additional funding.